The Bellagio is one of the great casino hotels of Las Vegas, and a world famous landmark in its own right. It is rightly famed for its accommodations, hospitality, and for the amenities and shopping that it provides – but what draws people here, above all, is the thrill of being in Las Vegas and the excitement of the casino floor itself. Even if you don’t want to gamble, the Bellagio has plenty more to offer. 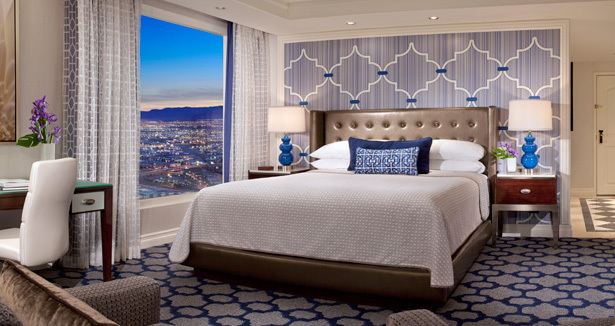 Accommodations at the Bellagio are everything you would expect from an AAA Five Diamond Award-winning resort, with fantastic views over the Strip and the mountains, lavish room service, and amenities including full high-speed Internet in every room. Venturing outside, the Bellagio boasts some wonderful attractions, principally its famous fountains, but also the Bellagio Conservatory and Botanical Gardens – an oasis of tranquility in this most hectic of cities. The gardens are especially popular for wedding photos, and indeed the hotel has all the facilities necessary for an unforgettable wedding. The Bellagio can even arrange to broadcast your wedding live over the Internet, for family or friends who can’t be there in person! The Bellagio’s many dining options range from informal bar food to the stunning, award-winning “Le Cirque” restaurant, a minor masterpiece of style and opulence situated on an eight-acre lake – so whatever your tastes and budget, you are unlikely to be disappointed. If you win some money on the gaming floor, the Via Bellagio offers some of the best shopping to be found anywhere in the world – from Armani to Yves Saint Laurent, with almost every designer boutique you can imagine along the way. The main attraction for many people, of course, will always be the gaming floor itself, and the Bellagio boasts the most opulent casino floor in Las Vegas. All the games you would expect are available, from poker and blackjack to craps and roulette, and they cater to all budgets, from the high rollers to those who prefer to wager smaller amounts. Add in the hundreds of slot machines and video games, and you have an unbeatable package of entertainment, excitement, fine accommodations, and dining that sets the Bellagio apart from most of its competitors.